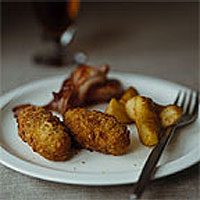 The original recipe for these crisp-coated croquettes with a soft cheesy heart called for Glamorgan, a firm-crumbed sheep's cheese. Sadly, this is no longer made; replace with Caerphilly or a mature Cheshire. Put all the sausage ingredients in a large bowl and mix together lightly with your fingertips, adding a little milk if it seems dry. Don't overwork or the sausages will be stodgy. Put the beaten egg for coating on one plate, and the dry breadcrumbs on another. Form the sausage mixture into about 20 little sausage-shaped rolls. Dip each first in the egg and then into the breadcrumbs, pressing firmly to coat. Heat enough oil to shallow-fry in a large frying pan over a medium-high heat. Fry the sausages, a few at a time, for 5-7 minutes, turning occasionally until crisp and golden, then drain on kitchen paper. Serve hot. These are good for brunch with crispy bacon and fried apples or an apple chutney. For a seductive supper, serve piping hot with chilled oysters on the half-shell.